Two years ago, the rejuvenated Hammer studio put out what became the most commercially successful British horror movie in history: THE WOMAN IN BLACK. It starred Daniel Radcliffe as a Victorian lawyer, terrified by a vengeful ghost in a haunted house. My review at the time suggested I was none too impressed by the film although I seem to remember it more fondly. At any rate, I was sufficiently interested to watch the sequel, ANGEL OF DEATH. Wisely, the studio has gone with a new production team taken mostly from the British TV show Peaky Blinders, including director Tom Harper and cinematographer George Steel. They have created a genuinely scary movie, with a sinister, menacing style, psychological depth, and a satisfying emotional core. It feels like this is exactly where the WOMAN IN BLACK franchise needs to be, and I hope the studio sticks with this set-up for the inevitable threequel. This movie is set during the Blitz with two schoolteachers taking their class of evacuated schoolchildren to the now deserted Eel Marsh House on a barren island cut off from the mainland by a perilous causeway. Helen McCrory's headmistress represents the British stiff upper lip: determined not to admit that something is horribly wrong in the dilapidated house but her young colleague Eve (Pheobe Fox) is immediately on edge. It's her relationship with the haunted child Edward (the deliciously named Oaklee Pendergast) that anchors the film, as well as her incipient romance with pilot Harry Burnstow (Jeremy Irvine). As the horror builds and the death toll mounts, the film - as all the best horror - begins to deal with very complex psychological issues around motherhood, grief, trauma and guilt, culminating in a really satisfying ending. Not only do we feel thoroughly scared but also that we've got to know fully rounded characters rather than stock horror tropes. This is also one of the most beautifully shot, dreamily misty haunted house horror movies since THE OTHERS. Overall, a beautiful, petrifying and deeply moving film and a massive improvement on the original. 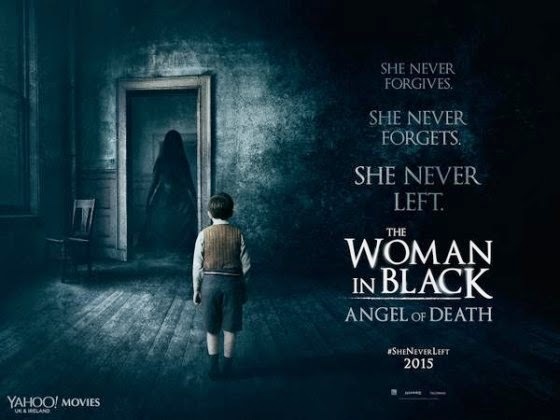 THE WOMAN IN BLACK 2: ANGEL OF DEATH has a running time of 98 minutes and is rated PG-13 in the UK. It will be release in the UK, Ireland and USA on January 2nd 2015, in France on January 14th, in Greece and Singapore on January 15th, in Spain on January 16th, in the Czech Republic, Malaysia and the Netherlands on February 12th, in Argentina and Germany on February 19th and in Brazil on March 12th.